To say that history's greatest economic experiment--Soviet communism--was also its greatest economic failure is to say what many consider obvious. 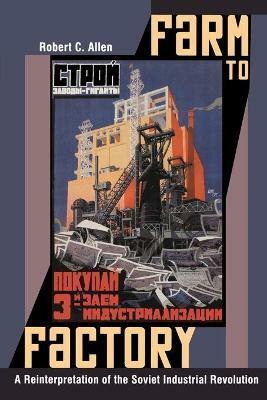 Here, in a startling reinterpretation, Robert Allen argues that the USSR was one of the most successful developing economies of the twentieth century. He reaches this provocative conclusion by recalculating national consumption and using economic, demographic, and computer simulation models to address the "what if" questions central to Soviet history. Moreover, by comparing Soviet performance not only with advanced but with less developed countries, he provides a meaningful context for its evaluation. Although the Russian economy began to develop in the late nineteenth century based on wheat exports, modern economic growth proved elusive. But growth was rapid from 1928 to the 1970s--due to successful Five Year Plans. Notwithstanding the horrors of Stalinism, the building of heavy industry accelerated growth during the 1930s and raised living standards, especially for the many peasants who moved to cities. A sudden drop in fertility due to the education of women and their employment outside the home also facilitated growth. While highlighting the previously underemphasized achievements of Soviet planning, Farm to Factory also shows, through methodical analysis set in fluid prose, that Stalin's worst excesses--such as the bloody collectivization of agriculture--did little to spur growth. Economic development stagnated after 1970, as vital resources were diverted to the military and as a Soviet leadership lacking in original thought pursued wasteful investments. Illustrations note 34 line illus. 36 tables. Robert C. Allen is Professor of Economic History at Oxford University and a Fellow of the Royal Society of Canada. He is the author of "Enclosure and the Yeoman".